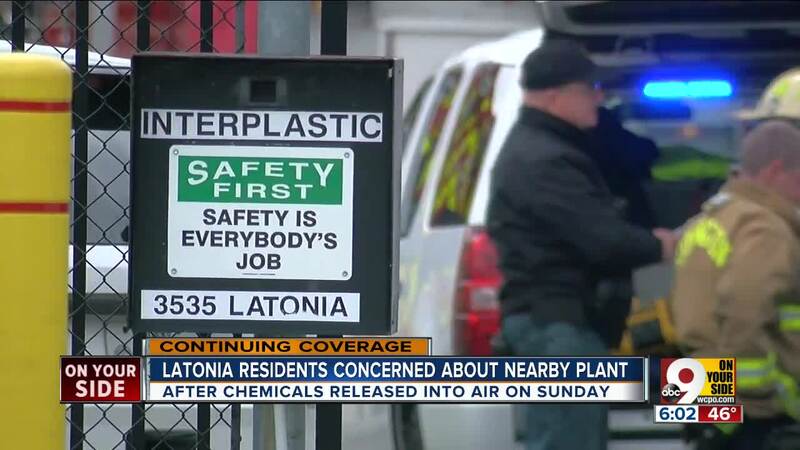 COVINGTON, Ky. — After an apparent equipment failure resulted in a chemical release and shelter-in-place order Sunday, Latonia residents said it's not unusual for strange smells to come from a nearby plastic plant. Glen Napier has lived in Latonia near the plant for 30 years. He said there has always seemed to be chemical odors coming from the nearby Interplastic Corportation plant in Fort Wright. "I'm so used to smelling it, I've had days that were worse than yesterday," he said. A group of neighbors once sued the company, but Napier said the problems never went away. "You're a prisoner in your own house, I guess," he said. "I don't know. There's nothing really you can do." Hundreds of people were told to stay inside, close their windows and shut off any ventilation to the outside after a mixture of chemicals was released into the air Sunday. Fort Wright Fire Chief Stephen Schewe said the chemicals released Sunday post no serious health risks to the community, but they are a minor throat irritant if breathed in. Latonia resident Judith Moore said she first noticed strange smells being released from the plant in the 1980s and started to get headaches regularly. "And it would actually make your nose burn," she said. "Nauseous, headaches — I've had headaches ever since." In 1997, Moore and more than 800 of her neighbors filed a class action lawsuit against Interplastic Corporation. The lawsuit was settled in 2004 for $4.75 million, and the attorney who filed the suit said the company was required to put in extra safety measures to prevent uncontrolled chemical releases. "It got a little better after the lawsuit, but over the last couple of years it started back up again," Moore said. Interplastic Corporation is still investigating what happened Sunday, according to a worker. The company needs to file a report with the Kentucky Department of Environmental Protection.